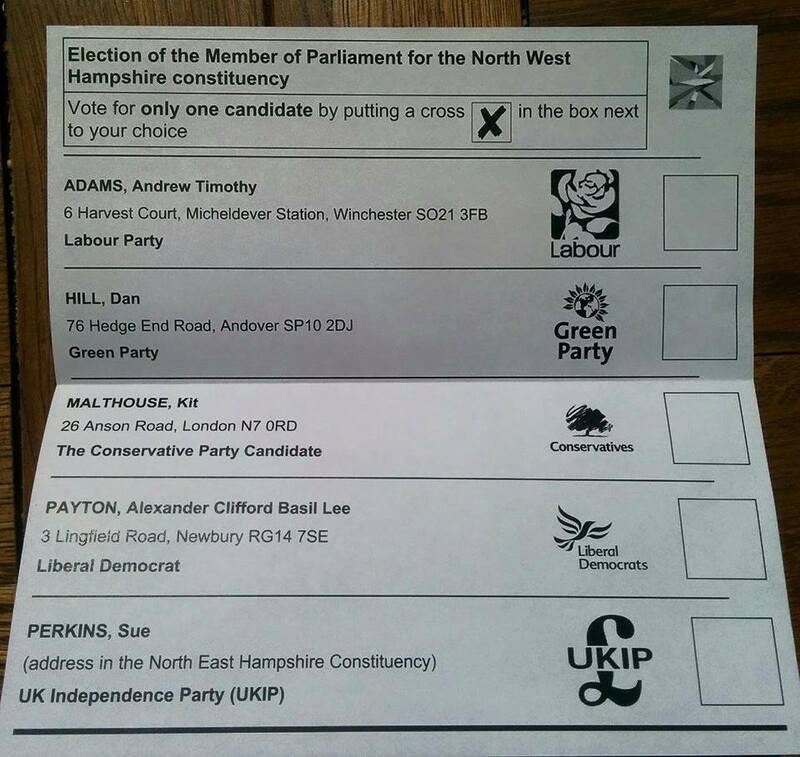 The postal ballot paper in North West Hampshire constituency for May 7, 2015 general election lists 5 candidates. The North-West Hampshire constituency, around Andover and where I live in Whitchurch, Hampshire, is home to many people who choose to cycle or walk or drive. Hang on, so is every other place in the UK! We are all people making choices about how we travel to the shops, offices, schools, and places where our friends and family live. Create a cycling budget of £10 per person per year, increasing to £20. The population of the UK is about 64.1 million, so that recommendation would equate to about £641 million per year. The government of The Netherlands, where 25% of the population cycle, spends about £28 per person per year. Presently the UK spends about £1.37 per person per year. You can ask each candidate to ‘VoteBike’ by using the form at the CTC VokeBike website. As of 29 April, just 1 candidate has declared their support. The CTC has collated each political party’s manifesto statements about cycling: Election manifestos: what do they promise for cycling? The CTC is also running a ‘VoteBike’ campaign. Two candidates (Labour, Green) have signed up for it. UPDATE: The leader of the Conservatives, Prime Minster David Cameron also signed the VoteBike campaign (see HERE) and wrote a letter to the CTC which was very supportive of cycling (see HERE). The area’s former MP, Sir George Young, a Conservative, retired. That means the area will have a new MP (some candidates have held elected positions in councils before). Below are the responses I received. All embolding and italics added were added by me. The ballot paper lists his address in Winchester (outside of the constituency). Answer awaited and will be published here when received. Labour has a strong program of measures to support cycling including – Tough new rules for HGVs. A Cycle Safety Assessment of all new road schemes. Give local authorities greater responsibility to support cycling. End the stop-start approach to supporting cycling infrastructure. Encourage more people to commute to work by bike. Ensure that children and young people have every opportunity to cycle safely. Restore national targets to cut deaths and serious injuries and a new target to increase levels of cycling. Review of justice system and how it protects vulnerable road users In my own constituency of North West Hampshire I will work to ensure that quality cycling routes and facilities are incorporated in all new developments to encourage the growth of cycling as the default method of urban transport in small and medium sized towns such as Andover and Whitchurch as well as promoting rural cycling opportunities. The ballot paper lists his address in Andover (within the constituency). I get a little exasperated every time I see a white bicycle painted on the road. Quieter stretches like Bachelor’s Barn Road I can just about forgive but Charlton Road to the Folly Roundabout!? My bike is in the garage. I tried it again a couple of years ago but I just can’t abide the genuine sense of fear that comes with it. Either from prosecution by being on the pavement or of serious injury being on the road. Luckily work is only a half an hour walk away and town is half that. The cyclist is seen as a second class road user and we need to get that changed. There are three approaches to this that I can see: 1) Reduce the volume of vehicles on the road. Encouraging public transport for passengers. Rail for freight. Cargo bikes for deliveries. 2) Proper, unmistakable cycle lanes. Not paths with a white paint line on it that goes largely ignored by pedestrians. 3) Change attitudes. To perceive the cyclist as a vulnerable road user and give them the space and respect you’d want it their position. Kit was the deputy mayor of London, and the ballot paper lists his address in London (outside the constituency). Aside: Kit included a response to a question I posted in a comment to an article on his website about renewable energy (he has chosen not to publish my comment, which asked simply: what energy source was used to produce the hydrogen for the fuel cells?). UPDATE: Kit was elected on 7 May (results HERE). Andrew thanks for this. As someone who cycles every day I am of course keen to make our roads more cycle friendly. As you may know I have until recently been part of Boris Johnson’s team and we have started something of a cycle revolution in London over the past few years. Having looked at the site and watched the video, I would certainly support the broad thrust of the campaign but obviously the devil is in the detail of specific schemes, where a balance needs to be struck between cyclists and other road users. In fact I often find that the worst thing about cycling is other cyclists, especially in a built up area, where some are like kamikaze pilots, whizzing through red lights, cutting other cyclists up and generally behaving very badly and being rude. I do think that if we are to make progress on cycling generally, cyclists have to shoulder some of the responsibility for making it a pleasant way to travel for everyone. Andrew I also see you have posted a question on my website. There are plenty of sustainable ways to generate hydrogen without wind power – solar, anaerobic digestion of waste or biomass, geothermal – and I’m not an opponent of nuclear power either. You may also be interested to know that there is a lot of research going on to find the catalyst that will split water with the application of sunlight – this would revolutionise energy generation across the board, not only for propulsion, but for everything else too. I suppose I don’t mind offshore wind, and of course H2 works well as a store of intermittent wind energy, but I still think it’s old technology and there are smarter ways to use chemistry and physics to solve our problems. I hope were we can agree is that burning things to generate energy (oil, coal, wood even) is something we need to work to phase out, not just for environmental reasons, but also because we need oil in particular for other important things. The ballot paper lists his address in Newbury (outside of the constituency). The ballot paper did not list her address (it only stated that it was outside of the constituency). I certainly support making cycling accessible and safe as it a healthy means of travel and would lead to less congestion if people cycle more rather than use cars. I cannot give a firm commitment to all of the below for all areas until I have had the time to look into the feasibility and cost of these proposals – it is something I would do if elected as I have had a number of similar enquiries from potential constituents in NW Hants.